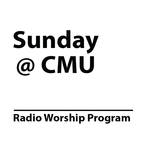 Sunday@CMU is a 15-minute radio program that features biblical meditations from current and emeritus professors, music from CMU ensembles and choirs, and interviews with faculty, staff, students, and alumni. Tune in Sundays from 8:30–8:45 AM on these Golden West radio stations in Manitoba: CFAM Radio 950 in Altona, AM1250 Radio in Steinbach, & CJRB Radio 1220 in Boissevain. Dr. John Brubacher, Assistant Professor of Biology, presents a four-part sermon series exploring 1 John 1:5-7. Dr. V. George Shillington, Professor Emeritus at CMU, presents a five-part sermon series exploring metaphors in scripture that we often quote or cite. Dr. John J. Friesen, Professor Emeritus of History and Theology, presents a four-part sermon series exploring Anabaptism. Karen Schellenberg, a Winnipeg pastor and alumna of CMU's Graduate School of Theology and Ministry, presents a four-part sermon series exploring the story from Mark 5: 24-34 where Jesus heals the bleeding woman. Dr. Sue Sorensen, Associate Professor of English, presents a four-part sermon series exploring Advent and Christmas.